[mashshare] Santa Cruz CA- Utility giant PG&E is threatening to turn off the power to Lois Robin, an 84 year old woman from Santa Cruz because she’s refusing to pay “opt-out” fees for keeping an analog meter. PG&E sent Lois a 15 day shut off notice in February, stating she owed $115. On Friday she received a message they will cut off her power today if she doesn’t pay. PG&E claims they have legal authority granted by the California Public Utilities Commission (CPUC) to collect the fees. Emails between PG&E and the CPUC recently made public expose collusion, cover-up, multiple exparte violations and the broken regulatory process by which smart meter opt-out fees were concocted. 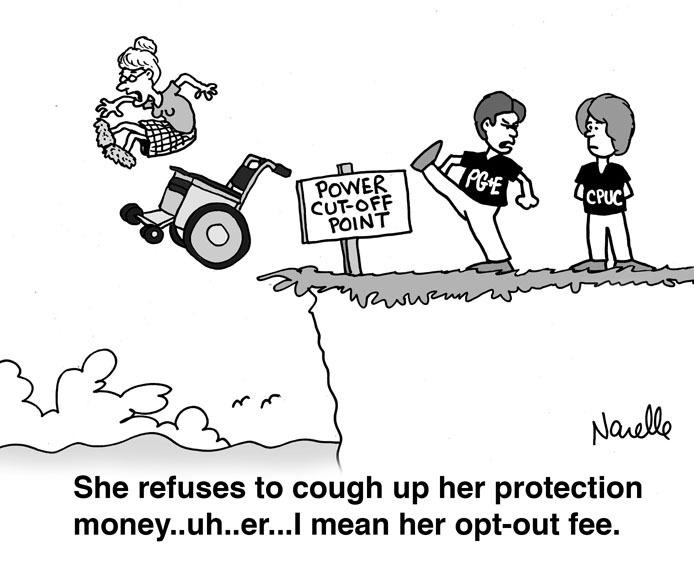 Smart meter opt-out fees were fabricated between the CPUC and PG&E long before the evidentiary hearings on costs began. You have persisted so far. I am proud of the sample you have set. Let’s see if PG&E wants to be classified as an Elder Abuser. Pingback: PG&E Threatening 84-Year-Old Santa Cruz Woman with Disconnect if She Fails to Pay Protection Racket Fee | Stop Smart Meters! I have to obtain 3 licenses, years of hands-on experience, pay tens of thousands of dollars over 7 or more years of studying, apprenticeship, exams, etc. for the right to start working as a mundane self-employed home electrician. Regulators are robbing us because we have to pay for every license and then for every job we do. How can ppl in North America fight various regulators who often act like criminals?